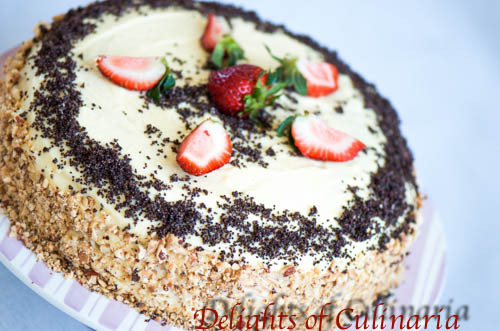 If you’re a big fan of poppy seeds then you’ll love this cake.Soft sponge cake with lightly sweetened pastry cream,dulce de leche, and of course poppy seeds.I love anything with poppy seeds especially cakes. 1 1/4 cup sifted self rising flour or regular but add 1/2 teaspoon baking powder. Place poppy seeds in a small sauce pan.Cover with water.Bring to a boil,then reduce heat to low. Cook for 30 minutes,strain, and let it cool. Grind poppy seeds using a meat grinder. Using a mixer, beat eggs with sugar until thick and pale in color. Gradually add sifted flour and mix on low. Bake for about 35-40 minutes or until the top is golden brown in color. Whip softened butter with a mixer.Gradually add in pastry cream by 2-3 tablespoons at first 2-3 times.Reserve half of pastry cream for later. Add cooked condensed milk and poppy seeds.Whip it on high speed for few minutes. Divide sponge cake to equal 3 layers. Spray or pour syrup on the first layer. Spread a generous amount of poppy seed cream. Cover with the second layer and repeat the steps. Place the third layer on top and spread the reserved pastry cream on the top and around the sides of the cake.Add crushed hazelnuts to the sides of the cake.Decorate the top as desired. Nadia this cake looks super delicious:) Can’t wait to try it!!! Thanks! yes you should try it. Really ggod. 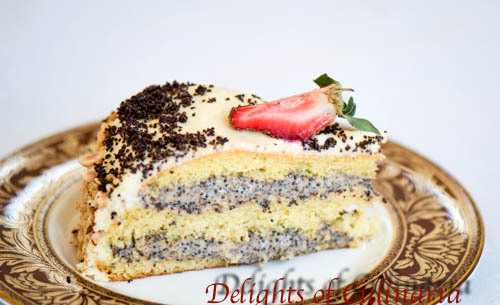 mmmm……Nadia, I love cakes with poppy seeds… Looks realy good. Looks so delicious… how much servings does this make? It’s really good,Leana. About 10 -12 people, depending how big you slice the cake. Would omitting the custard cream still make the cake delicious? Yes, it will be still good. I would recommend cream that I use for kievskiy cake(Kiev cake). Or with dulce de leche cream. You can even do everything in the recipe,just replace custard by adding heavy cream (about 1/2 cups) and a little powdered sugar.beat on high until nice and stiff.i didn’t try it using this cream, but my guess that it will be good. How long in advance can I make the cake? If I bake it on Friday and put it together with the cream on Saturday to be eaten on Sunday, will it still be ok? Also, what kind of meat grinder do you use for the poppy seeds? How small are the poppy seeds supposed to be ground? Thanks! Looks yummy! Yes you can! Just wrap the cake in plastic wrap when it’s completely cooled. But I noticed cakes(sponge cake)taste better when done all at once. Oh and about grinder … it’s a kitchen aid mixer attachment. The smallest one. I know people did it with manual old fashion one too.